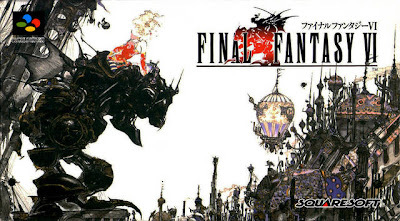 Fantasy VI, though at the time I knew it as III. Featuring a cast of colorful characters, a deep, engaging storyline, and battle systems that were far more detailed than anything I’d ever seen, I was smitten with the plot of Terra trying to find her identity. Slowly, other RPGs came into my life like Final Fantasy VII, Chrono Trigger, Chrono Cross, and Final Fantasy IX. One day, I was in search of an old RPG to play, something that would really steal my free time and attention. 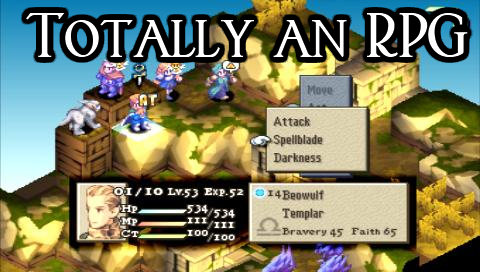 One post on a message board later and I had nine replies, most of which recommended tactics games which are totally not RPGs, but one title came up a few times called Secret of Mana. I’d never played it, so I downloaded the game and started playing. Immediately, I was painfully aware that it wasn’t an RPG. It had the graphics of an RPG, the story of an RPG, the emotion-jerking music of an RPG, but you ran around freely and hit things with a sword like in Zelda. What the heck, I thought, am I missing something? 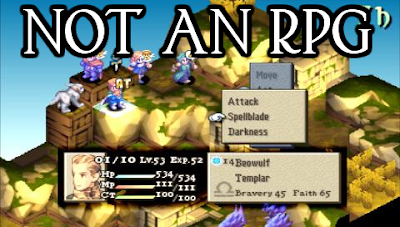 I continued playing, but brushed it off as people not knowing the actual definition of RPG. This trend continued until sometime in 2006 in which I had a debate with one of my roommates about best RPGs of all time. Of course I said Final Fantasy VI, what sane person who’s played it wouldn’t? But he kept arguing for Final Fantasy Tactics and would not budge. And once again, I was faced with ignorance. Only this time, I realized it was my own. I started doing research into RPGs, not knowing what the title really meant anymore. In my mind, an RPG was categorized by a turn-based fighting combat with a narrative-driven plot that featured a host of playable characters, quests, and bosses. As it turns out, that definition is incredibly narrow. The actual definition is far broader. The definition according to Wikipedia is “a game in which players assume the roles of characters in a fictional setting.” I also found out there are multiple types of RPG. Games like Secret of Mana and Mass Effect are classified as action RPGs since they aren’t turn based, but still feature most of the qualities of a traditional turn-based RPG. The same applies to strategy RPGs like Final Fantasy Tactics or Fire Emblem. Dungeon crawlers like Diablo also count as RPGs. Is Legend of Zelda an action RPG in which items and hearts are used in lieu of stats for managing progress? What about Gears of War? Is that an action RPG that doesn’t have stat management, but still has parties? 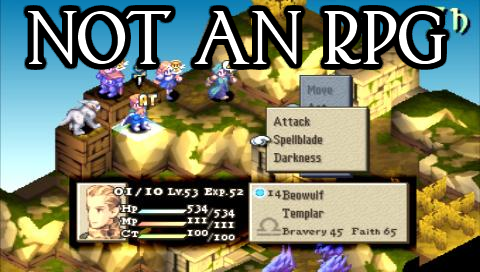 These examples may be a little extreme, but the definition of RPG is so vague that it invites far more games to the category than it rightfully should. And to alleviate that, we’ve created sub-genres on top of sub-genres just to try and get some sort of meaningful description of the game we’re playing. Bioshock could be described as a first person shooter action role playing game. That’s a mouthful. What about FPS action RPG? Does that make it better? Do you gain any ideas about the game by hearing that description? Let’s try an experiment. Let’s say I’m raving about a new game that you’ve never heard of called Quintessence. It’s absolutely incredible! It’s challenging, addicting, and so deep that it has tons of replay value, I rave. Oh yeah, you say, half-heartedly listening, What genre is it? It’s at the forefront of the first person shooter adventure puzzle role playing game genre. You scratch your head for a second, trying to grasp what that game would even entail. So the camera is from the perspective of the player, you solve puzzles, maybe you’re trying to be Indiana Jones, and maybe there’s a stat management system? As it turns out, I got my names mixed up and what I meant to say instead of Quintessence is Portal. 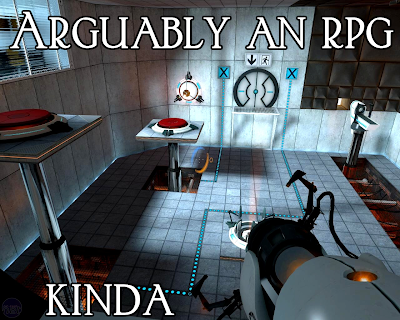 If you really get down to it, Portal is a first person shooter in which you solve puzzles, are exploring a facility, and are playing as the character of Chell. Obviously this is a stretch, but you get my meaning — RPG is no longer a useful classification of game. It’s my belief that genre classifications had their place in time and that time was gone. When there were very few reference points to draw on, it was easy to say “Chrono Trigger is an RPG” since that conjured ideas of Dragon Warrior and Final Fantasy. But now, that word refers to so many games, the only thing telling me a game’s genre does is tell me what it’s not. If Ni No Kuni is an RPG, I’m positive it’s not a sports game, at least until sports RPGs become a thing. Oh wait, that’d be Football Manager. Add another to the list. Instead of giving me the game’s genre, tell me what games it’s like. 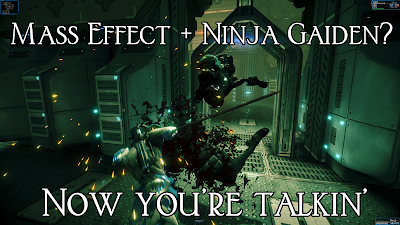 Instead of telling me Warframe is a third person action FPS, tell me it’s like Mass Effect with Ninja Gaiden’s platforming, but online. 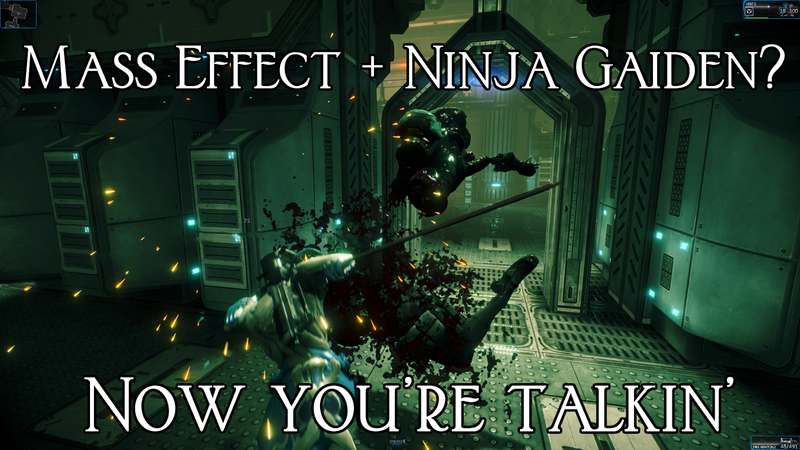 And even if I haven’t played Mass Effect, you can describe it using a few games. Since the Nintendo-era of gaming, we have almost 30 years of games to draw comparisons to, comparisons that bring forth far more information and experiences to draw on than a generic genre. I’ve already stated why we don’t do score reviews on this site, and it seems genre classifications are similar — it’s an arbitrary system that has been aged past the point of usefulness. And just as describing games with similar titles brings forth ideas about quality and how much you may personally like it, they also set expectation for what the player may experience in the game. This approach to game classification and critique is far more useful and holistic than arbitrary filing systems simply because experiences and memories bring far more information to your mind than words. Though shifting from genre classifications would be difficult, as it’s a language most people understand even if it had very little meaning anymore, it’s a necessary shift in order to talk about a form of media with actual data rather than theory. Instead of trying to fit games to a vague ideal, you can pick and choose bits of other games people may have played to describe a game more vividly and informatively, using definitions players make for themselves, not the ones they’re given. And that’s a powerful tool.